If loving today’s Nice Price or Crack Pipe CJ8 is wrong then I don’t want to be right. That’s because it’s right-hand drive and one of only about 230 built. Let’s see if that and its condition will make paying its asking price the right thing to do. The C5 Corvette might just have come at an inopportune time in General Motors’ history. In the mid-nineties GM was festooning their wares with all sorts of plastic body panels, mediocre styling tropes, and dashboard designs so puffy and Rubenesque that they seemed to have been stung by many angry bees. The C5 suffered this latter ignominy, and the crappy switchgear and unflattering interior styling may be one of the reasons that the cars seem to be under appreciated today. Few of you appreciated the price of yesterday’s ultra-low mileage C5 Corvette FRC, nor its apparent rarity as it fell in a decisive 63% Crack Pipe loss. So far this week we’ve had some rare cars (and the hope is that Monday’s car will stay rare) but also cars that were asking new-car money. Today let’s break that chain and do what’s right, or maybe... what’s right-hand drive. 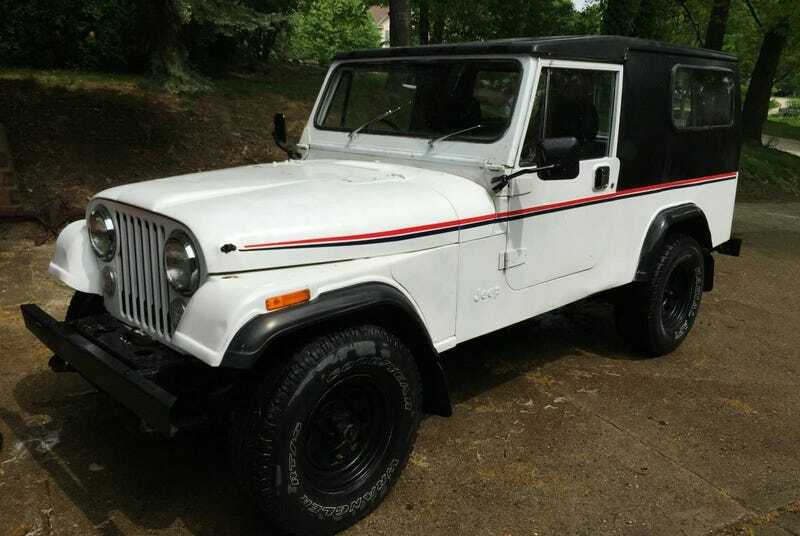 This 1984 Jeep CJ8 Scrambler would be interesting simply because its model, the long wheelbase CJ8, is a fairly rare duck these days seeing as when new they were relatively ignored by Jeep buyers. Because of that, they now command a premium. This one however, take that rarity quotient and throttles it up. That’s because this is one of about 230 right-hand drive CJ8s that Jeep built for the U.S. Postal Service (the neither rain, nor snow nor dark of night folks) as evaluation models for route carriers in Alaska. This one is now in Michigan and is a little rough around the edges. Still, it looks like it might be serviceable just as it is. The top is a World Cab, used with windows in export markets but on the Postal Jeeps as a van-like rear quarter. A previous owner has punched a pair of small windows in the sides, and covered the whole top with bed liner. Nicely, it comes with the World Cab doors which are squared off in the top-rear corners rather than rounded like regular Scrambler doors. The rest of the truck is painted white with red and blue stripes down the flanks giving it the impression of still doing mail delivery duty. The seller says the paint is good from 10 feet but doesn’t stand up to closer inspection. There’s also a missing hood latch, a dent behind the near-side tail light, and wheels that have also been coated in bed liner. The inside looks to be in pretty good shape, although the seats aren’t original, and there’s some sort or insulation on the inside of the cap. The dash has everything you would expect, only backwards, and there’s both a lever for the 4WD and one for the three-speed automatic. The engine is a 4.2-litre carb’d OHV straight six, which is damn-near indestructible. That offered up 112-bhp and 210 lb-ft of torque when new. The frame seems sound and the floorboards have already been replaced and ‘glassed so you won’t have to Fred Flintstone the car to drive it. The back door is said to need work (maybe that dent in the side?) and there’s some issue with the carb that affects driving. Mileage is claimed to be 62,502, but I’m betting it’s rolled over at least once. If your dream has always been to drive a proper Land Rover from England but the whole Brexit deal has you worried that will now never happen, then this just might be the best alternative there is, sort of like the Stig’s fat American cousin. If you would like to try that out you’ll need to come up with $8,450 OBO. I don’t know about that “or body odor” bit, so I think we’ll play the price as it lies. What do you think about this rare RHD CJ8 and that $8,450 price? Does that seem like a deal to make mail your bag? Or, does that price make this a junk mail carrier? Detroit MI Craigslist, or go here if the ad disappears.